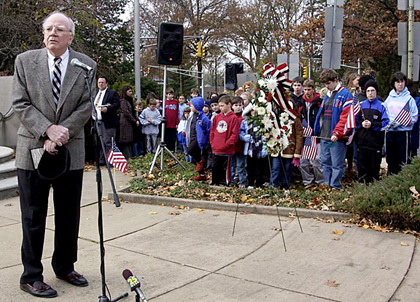 THE MAYOR SPEAKS: Among the speakers at Princeton's Veterans Day ceremony was Borough Mayor Joseph O'Neill. Among the onlookers were students from the Lewis School. Educating parents on signs of pre-gang behavior, holding a community meeting with area youths, and rebuilding trust between police and immigrants in town are some potential solutions that came out of a community dialog on race relations held by the Princeton Human Services Commission on Monday. Is a Princeton-based hospital necessary? Should a hospital in dire need of expansion remain in a built-out town when more than 80 percent of that hospital's patients are coming in from surrounding areas? In an effort to rebuild trust between police and the Latino community after a recent immigration raid in town, Borough Council unanimously passed a resolution last week calling for immigration reforms in the federal government.